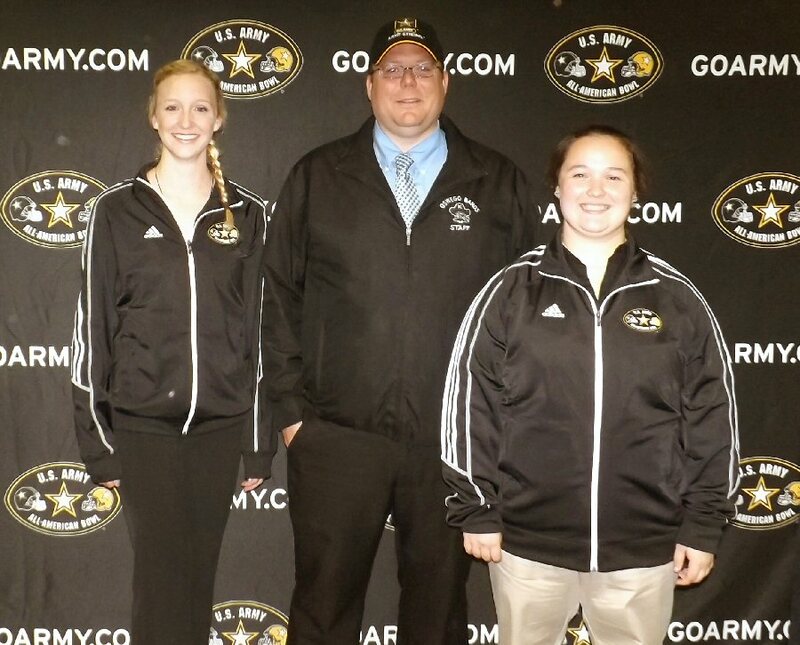 OSWEGO, NY – The 2014 U.S. Army All-American Bowl Selection Tour recruited a pair of Marching Buccaneers Thursday night to the Army All-American Marching Band. OHS student musicians Cassandra Hondro and Emily King said it took a lot of hard work to make the select group of musicians from around the country. They are, in fact, the only two musicians selected from New York State. Two students from different schools were also picked for colorguard. The U.S. Army All-American Bowl in San Antonio will be televised live on NBC, from the Alamodome on Jan. 4, 2014. The band will perform at halftime. Oswego band director Scott Ciesla is flanked by Cassie Hondro, left, and Emily King. Since 2007, Hondro and King are the 11th and 12th Marching Buccaneers to be selected for this honor. She did her auditions at home. Her first reaction when she learned she had been selected for the band? First the students had to get nominated, then they had to tape their auditions and fill out forms. The auditions (a self introduction video, marching and music videos, too) had a time limit. “They we had to wait,” Hondro added. That was probably the most difficult part of the entire process, the young ladies agreed. During a ceremony, immediately following practice for the Marching Buccaneers, US Army representatives officially announced the selection of Hondro and King to the U.S. Army All-American Marching Band. They were honored before other band members, classmates, fans and family during the post-rehearsal event. Chris Zeller, of the U.S. Army All-American Bowl Selection Tour, thanked everyone for attending. “We would like to honor the entire Oswego High School band for the support and commitment that you have shown to each other and to your school. Well done!” Zeller said. He then welcomed Hondro and King to the podium individually to present them with their official Army jacket and hat. Sergeant Brandon Preston presented them with their hats and jackets while many in the crowd took photographs and cheered loudly. The Army gave him the opportunity to do things he otherwise never would have been able to, he said. She also thanked her other family members, her friends, and all of the Marching Buc staff for always being there. “This is a huge honor for me and Cassie to have been accepted into a prestigious group like the All-American Marching Band. And, it’s even more special since we are the only two musicians from New York State. She challenged the juniors in the band to strive to keep the tradition going next year. “I’d like to thank my parents. My dad has always been my hero; but, I’d especially like to thank my mom for this one. She has always been involved in march band, guiding me,” Hondro said. It was her mother that encouraged her to stick with band when she was thinking of quitting in the sixth grade, she added. She also thanked her sister, Jacqueline Hondro, a previous All-American. “She is a huge inspiration to me,” she said. Hondro went on to recognize all her teachers, Marching Buc staff, and all her friends and family. “We are ever grateful for your service and sacrifices. From the bottom, of my heart, thank you so much for everything,” he told the Army representatives. He recognized three of Oswego’s former All-Americans in the audience – Gina Bartholomew, Chelsea Bartlett and Joseph Bertonneau. The five U.S. Army All-American Bowl Selection Tour teams travel across the country from late-September to mid-December to announce all 90 players and 125 marching musicians to the U.S. Army All-American Bowl and log a combined 30,000 miles.